Make a great first time impression! Presentation folders are a unique and classy way of protecting your important documents while giving them respect. 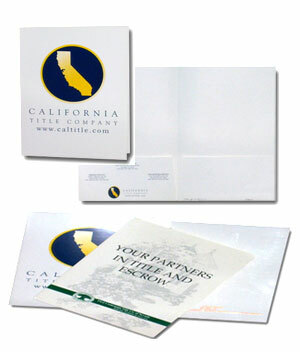 Use these folders to leave a lasting impression on your clients! These impressive folders are 9"x12" and are available in a high-gloss or matte finish. Complete with two inside 4" glued pockets and a cutout for your business card, this high quality folder will keep your company name and contact information in front of your clients. These fully customizable folders are a great way to brand your company while providing a stylish, well designed folder that is pleasing to the eye, as well as highly functional.